Aaron found this proverbial glass slipper and seized the opportunity to arrange a first date. This move has since been coined, ‘Operation: Bowl Return.’ The date was clearly a success, starting out as coffee and turning into dinner and drinks and finishing with a series of questions about each others likes, dislikes, aspirations, and shoe size. A mere six weeks later, we were planning our first trip together. 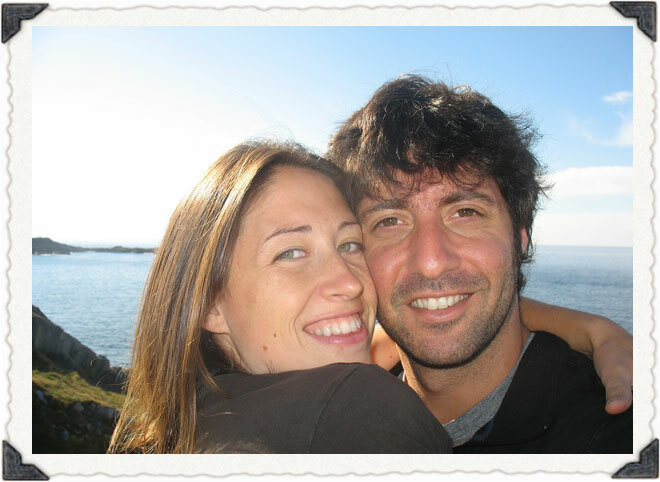 We decided upon Newfoundland and it proved to be the perfect place to fall in love. 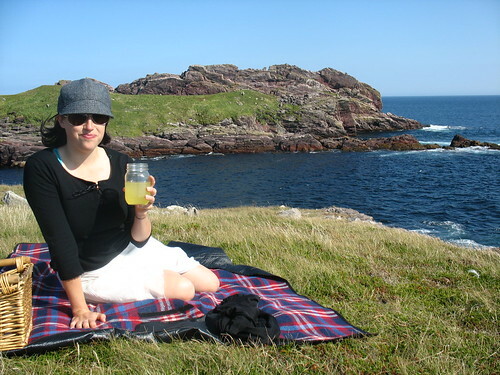 Our connection deepened while camping on a cliff towering above the ocean, watching whales while lying on the grass enjoying a delicious picnic lunch, and taking a fishing boat out onto the choppy waters of Placentia Bay. We had an amazing time getting to know each other and meeting wonderful people and seeing breathtaking scenery. We could go on and on, but we may have already lost you, so we’ll just leave it there. Check out our blog for more stories and updates on our wedding plans. It sure sounds to me like Aaron wrote this account. If it was Tara…then you two are a match! Although I’ve met you a couple of times, Tara, I can’t wait to get to know you better…who is this person who will be sharing her life with my nephew? You must be something special to have reigned(sp?) him in…he’s been waiting for the right person for a long time. Aaron, I imagine you’ve already told Tara everything there is to know about your Aunt Dorothy…I mean wouldn’t I be part of your conversation on a daily basis??? OK…well enough with the silly talk…I’ve got to get back to work. Looking forward to seeing you on Friday! Cafe Mondo! I love that place! And your shower invititation was unique. Lots of love, A.D. Thanks Aunt Dorothy! Actually, Tara did write this…and yes, I told her all about you! Thanks Dorothy! I am looking forward to getting to know you as well. Aaron speaks so highly of you. I must admit that I can’t take credit for the shower location or invitation…that was all Carol and Aaron’s sisters. And they did a great job! I’m looking forward to seeing you there. Sounds like the 2 of you are going to have a great life together. Aaron, I am sure that you have talked more to Tara about us than Aunt Dorothy……..ha,ha. She’s soooo small there isn’t much to talk about. I am wearing one of those T Shirts that you did for the Board of Education some years ago…… it seems to have shrunk! We look forward to seeing you and Tara in August. P.S. Don’t listen to your Uncle Roger if he says any negative things about us. Because you know he is a little goofy at times. WELL!!! Tara…not to start a bunch of “warring” comments between me and my CRAZY brother, just remember “BIG things come in SMALL packages!” Don’t bother replying Richard…I’m not listening any more. Man…I’ve got work to do here.